Walter W. Gauer, Founder and Chairman of Gauer Metal Products passed away on Sunday, December 30th 2012. He was 90 years old. Mr. Gauer courageously battled a heart valve condition over the past few months. In September, he was told by his doctors that he would not survive another night and was taken off his medication. Without medication, through shear willpower, Walter decided that he wanted to see his 90th birthday. His family was planning his birthday party for a few months, and he was not going to let his loved ones down. He triumphantly recovered and was well enough to undergo a surgical procedure to expand the heart valve temporarily. This procedure was due to be followed up a few days prior to his death. However, Mr. Gauer’s health began to decline again two days prior to the scheduled procedure. Walter Gauer will be greatly missed by his family and the extended family that he has created at Gauer Metal Products. He, himself being of modest education, has taught so many about life, business, honor and love. The offices of Gauer Metal will not feel the same with his absence. He has been a constant fixture within the company since he founded the business with his brother Edward Gauer and machinist Gene Wroble in 1946. Walter Gauer was born with humble accommodations in Deans, NJ on October 22nd 1922. During the Great Depression his father was forced to give up farming and move to New York City, where he made a living crafting wax sculptures. Walter, as a young boy, emulated his father’s entrepreneurship by making a shine box and shining shoes in the streets of New York City. He quickly built a second shine box and had a local kid work with him giving young Walter half of the revenue earned. Unfortunately, Walter did not have much time to learn about business from his father, he lost him at a very young age. Walter served his country as a U.S. Marine in the South Pacific with the USMC’s 6th Division during World War II. It was during his military service where Walter Gauer began to become more aware of his religion. Walter was sergeant to two machine gun squads, while in combat he had multiple near death experiences and felt that he was spared for a reason. Once, to the amazement of his squads, he (unknowingly) outran enemy machine gun fire while moving between his squads’ posts. They were sure that he knew the gunfire that was hitting the ground behind each of his steps and he was completely unshaken. He did not disparage their beliefs until they met up again many years later, it is better to have your men thinking that you are a rock, when you are in constant life and death situations. Another moment where he felt that he was being looked after was when, during heavy mortar fire, he saw a “flash of light.” This was normal during these types of situations, he would see many flashes in the distance and would not be bothered, but for some reason he got down in his foxhole. Seconds later, a mortar hit right next to his foxhole and he was covered over by dirt. It was a dud, and he again was left uninjured. He was injured a couple of times during battle, once by shrapnel and another time by white phosphorus. In both of these situations he refused evacuation for his injuries. Perhaps Walter Gauer’s most memorable role was when the Marines were finally able to take and hold Sugar Loaf Hill in Okinawa. This 50 foot high, 300 yard long hill was one of the two key positions that exposed the Japanese around Shuri on both sides. This hill took 11 tries and 1,656 lives during a 12 day period for the Marines to take and hold this hill. This was his section’s second attempt to hold Sugar Loaf Hill, they took the hill once before, but were pushed back and unable to hold it through the night. During this 2nd attempt Walter heard the “tap” of the arming of a Japanese Granade. He looked and saw an enemy soldier throw a Granade in his direction, he jumped in a foxhole with one of his men and they both ducted in the hole. The Granade rolled down the other side of the hill, it was again a dud. Immediately after realizing this was not going to explode, he gave the order to throw their Grenades in the direction of that solder. The reason the Japanese were able to retake the hill every night was because they dug through caves in the hill and would come up behind US forces. This squad was unable to accomplish that, and his machine gun squads stayed active. They got reinforcements the next morning. Mr. Gauer was told by his Captain that he was being put in for the bronze star, but he refused this honor and said, “I did what anyone, in my situation, would do.” He did, however, receive the Purple Heart for his injuries he incurred during his service. After Walter Gauer was discharged from the USMC in 1946, he used his mustering out pay to purchase a surplus military truck. He and his partners, mentioned above, rented out space in Irvington, NJ and started the business. Under his leadership Gauer Metal Products eventually grew larger and in 1950 he purchased a building in Kenilworth, NJ where he and his wife Catherine also built their home. By this time, his brother had already passed away and Walter had stayed partners with his sister-in-law Helen Gauer. The company still began to outgrow this facility so Mr. Gauer purchased a lot down the road to build a larger building. His sister-in-law, Helen, was not in favor of making the expansion and Mr. Gauer’s vision for the company, so Walter gave her full ownership of the old building where she was happy to receive income for the rent. Mr. Gauer always looked after family first. This first new building was about 40,000 square feet, while the second 30,000 square foot facility was built a number of years later. 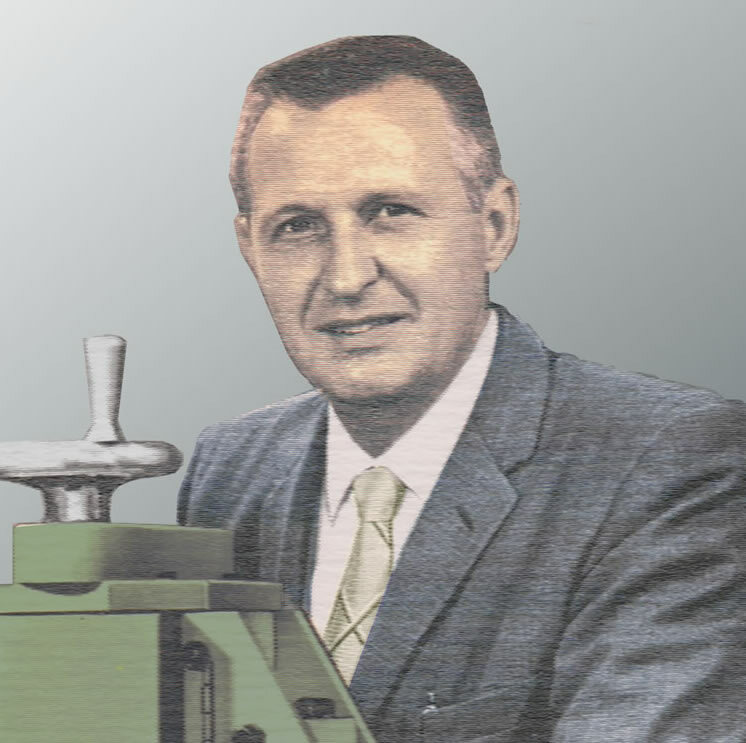 By this time Walter Gauer had become rather famous, in the metal industry, for creating Gauer Bar Edging Machines which created an entire new business for Gauer Bar, or edged flat bar, which appropriately bears his name. Gauer Metal Products continues to manufacture Edging Machines and Gauer Flo-Rak products that are sold worldwide. Mr. Gauer remained extremely active at this business until his death. Walter was active in both the church and the community. He was a devoted member of St. Theresa’s Church where he served as a trustee and a 3rd degree member of the Knights of Columbus 4186 in Kenilworth and 4th degree member of John F. Kennedy Council in Union. He was a director of several banks and Chairman of the Board of Blairstown Bank (now PNC Bank). He was a trustee of the Coarion Railroad in Pennsylvania and at Georgian Court College in Lakewood, NJ as well as a former member of the Rotary Club and Kenilworth Manufactures Association. Even with so many so many interests, his family was always first and most important to him. Walter is survived by his beloved wife of 63 years, Catherine; his children, Sharon, Walter, and Maureen; his son-in-law Dennis and daughter-in law Carol; his 16 cherished grandchildren and 11 great-grandchildren. He is predeceased by his daughter Arleen. Visitation will be Wednesday, January 2nd 2013 4:00PM to 8:00PM at Mastapeter Funeral Home, 400 Faitoute Ave. Roselle Park, NJ. A Funeral Mass will be offered 10:00AM on Thursday, January 3rd 2013 at St. Theresa’s Church in Kenilworth. The cemetery is private.